Planum sphenoidale and tuberculum sella meningiomas are challenging lesions that can be managed with endoscopic and open approaches. Appropriate patient selection for endoscopic versus open approaches is important for ensuring the best patient outcome. In 17.2, we focus on the indications, technique, and outcomes from open surgical approaches to these lesions. We discuss variables that dictate the choice of an open or endoscopic approach and provide several case examples for illustrative purposes. Specific surgical approach selection is also discussed, including bifrontal craniotomy, and pterional craniotomy with or without orbitotomy modifications. Finally, we provide a review of outcomes for open surgical approaches to these lesions, including our own case series. The eyebrow supraorbital keyhole approach (covered in 17.3) is a minimally invasive approach selected for patients with clinoidal, tuberculum sellae, and planum sphenoidale meningiomas. This approach, with use of the operative microscope and endoscopic assistance, offers direct access to anterior skull base lesions through a small eyebrow skin incision, keyhole craniotomy, and minimal brain retraction with reduced complications, morbidity, and hospitalization. Patient selection, surgical technique, outcomes, and complication avoidance are discussed with a review of the literature for this approach. The endoscopic endonasal transsphenoidal approach has evolved as an option for dealing with anterior cranial base tumors such as planum sphenoidale and tuberculum sella meningiomas. Improvement in surgical technique and instrumentation has led to clinical outcomes comparable to transcranial series. 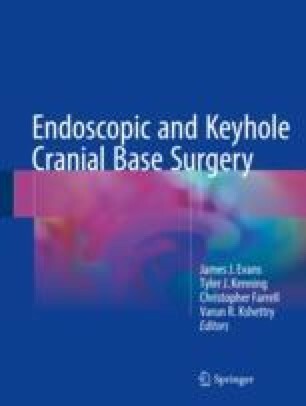 In 17.4, we describe our nuances in surgical technique, as well as the selection process for the indication of the endoscopic endonasal approach for these types of meningiomas. Additionally, we provide a description of pre- and postoperative management and, finally, a review of the current literature regarding clinical outcome. *Invited senior authors. See chapter subsection for complete list of authors.